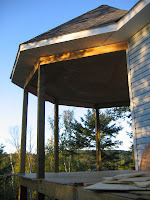 Cottage on the Edge - the DIY Cottage Blog: Security & Porch Ceilings - What is Luan? Security & Porch Ceilings - What is Luan? I was a bit concerned about the security of the Cottage with just vinyl soffit. 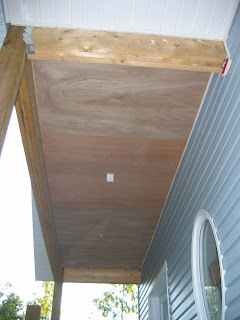 Vinyl soffit does not provide much barrier to someone wishing to enter the Cottage through the attic. While the soffit under the eaves is quite narrow ranging from 14 to 16 inches, the area under the front and back porches and the gazebo are quite large. Plus the support of the vinyl soffit over long lengths would be difficult. Our solution was to nail 1/4-inch plywood on to the bottom of the trusses. We used luan which has a nice mahogany look to it. 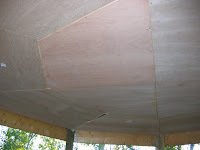 In some locations, specifically the gazebo ceiling, we also added 3" or 4" strapping to provide additional support. This approach worked real well for all three locations. In fact, with some molding to cover the joints between sheets of the plywood, and with the mahogany look, we are going to leave the plywood exposed in the gazebo and the back porch. Luan is a type of plywood and typically has a solid core material sandwiched between two layers of veneer. I believe the veneer is some species of low grade mahogany. Luan is typically used in interior applications, such as an underlayment for vinyl flooring. It's also used to make hollow core interior doors. We deemed that the look under the front porch still needs to conform to the Blue and White colour scheme - and that the mahogany look does not fit. So rather than paint the luan white, thus creating potentially for future maintenance, we are going to install the white soffit to this luan structure. With that we will get get looks and lots of security. The little white botches on the pictures above are actually tags to indicate to the electrician where the pot lights will be going. There will be two pot lights in the front porch ceiling and four in the gazebo ceiling.